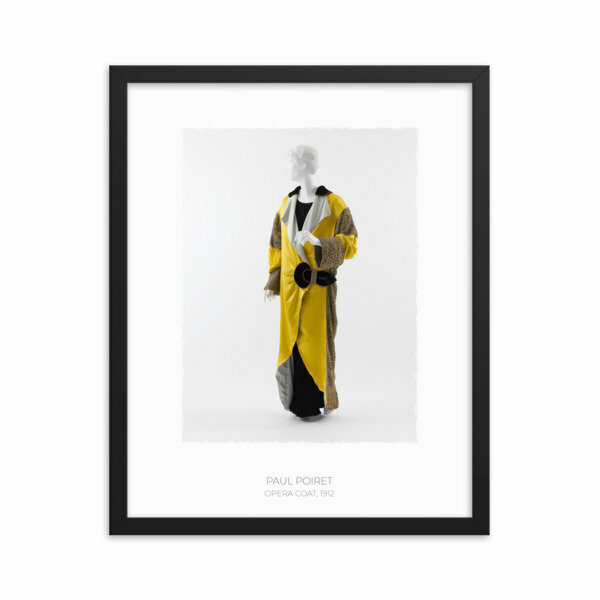 This opera coat of yellow and pale blue silk satin, black silk velvet, turquoise silk satin with gold and silver filé crocheted overlay, and silver filé trapunto half-belt and trim was interpreted by the illustrator George Lepape, whose album Les choses de Paul Poiret was exhibited at the Galerie Barbazanges, a commercial gallery on the premises of Poiret's couture house. The charming renderings of Lepape in Les choses de Paul Poiret (and later in the Gazette du bon ton) conveyed a contextual reality to Poiret's exquisite creations. Comparing extant costumes to their representation, however, often reveals that accuracy was sometimes sacrificed for dramatic intention. Nevertheless, Lepape's subtle stylistic elisions and exaggerations imbue Poiret's fashions with a beauty less seductively conveyed by the harsher documentary evidence of photography.